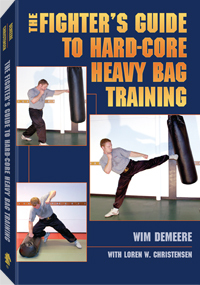 262 pages, 5.5" x 8.5"
Throughout The Fighter's Guide to Hard-Core Heavy Bag Training, Wim Demeere and Loren Christensen show you how to master the critical skills needed to survive a fight. From these acclaimed martial artists, you will get solid information on how to choose the right bag for your needs, how best to hang it, and how to care for it so it lasts for years. You will also learn the types of impacts and how to make the best use of them for specific situations; innovative drills to maximize your fitness level and fighting ability; creative ways to grapple a heavy bag, including chokes, takedowns, and armbars; and how to avoid the most common mistakes in heavy bag training. Whatever your fighting art or goal, you can benefit from the hard-core drills in this book.